European astronaut Alexander Gerst captured this spectacular image of the Cygnus spacecraft is it disintegrated in the atmosphere above the Pacific Ocean on Aug. 17, 2014. An astronaut and cosmonaut on the International Space Station captured some spectacular views of a private spaceship meeting it fiery end above Earth's surface after completing its mission on Sunday (Aug. 17). European Space Agency astronaut Alexander Gerst and Russian cosmonaut Maxim Suraev snapped some stunning photos of Orbital Sciences' unmanned Cygnus spacecraft as it burned up in Earth's atmosphere following its departure from the station last week. 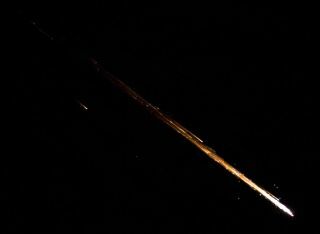 The photos show the robotic ship in pieces after it broke apart while streaking across the sky east of New Zealand at 9:15 a.m. EDT (1315 GMT), according to Orbital Sciences representatives. "From start to finish, we are very pleased with the results of this mission," Mr. Frank Culbertson, Executive Vice President and General Manager of Orbital's Advanced Programs Group said in a statement. "Our team is proud to be providing essential supplies to the ISS [International Space Station] crew so they can carry out their vital work in space." ESA astronaut Alexander Gerst caught this image of the Cygnus spacecraft re-entering Earth's atmosphere on Aug. 17, 2014. The demise of the Cygnus spacecraft marks the end of the private spaceflight company's second official cargo trip to the space station under a contract with NASA. Cygnus docked to the station on July 16 delivering 3,669 lbs (1,664 kilograms) of supplies to the six crewmembers on the orbiting outpost. After unloading the craft, the crew loaded it down with trash before sending Cygnus on its way to burn up harmlessly in the atmosphere. Orbital is planning to launch another Cygnus craft on a cargo run to the station from Virginia atop the company's Antares rocket in October. The next launch will be the third mission under a $1.9 billion contract with NASA for eight resupply missions. Russian cosmonaut Maxim Suraev captured this amazing picture of Orbital Sciences' Cygnus spacecraft breaking up in the atmosphere to the east of New Zealand on Aug. 17, 2014. NASA's Reid Wiseman and Steve Swanson and cosmonauts Oleg Artemyev and Alexander Skvortsov join Gerst and Suraev on the space station as part of the Expedition 40 crew. Orbital Sciences isn't the only company flying cargo missions to the space station. The private spaceflight company SpaceX also launches missions to the space station for NASA under a $1.6 billion deal for 12 missions using the company's Falcon 9 rocket and Dragon capsule.